Tonight's cows are running this way and that - southbound in the northbound lanes, eastbound in the westbound lanes. Running up and down ramps - jumping off the highway and running off into city streets. "I've never seen nothing like this. This is crazy," Stewart, a 12-year-veteran of the CHP said. "I'm not joking, they're everywhere." Stewart said there are 16 CHP units on the scene working with animal control trying to contain the cows. Mostly, the officers are using their patrol cars to herd the creatures. "It's like riding a horse, but it's a car," Stewart said. 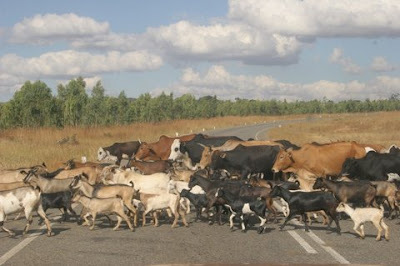 So, what prompted so many cows onto the highway to begin with? "Cows are some of the dumbest animals and they follow each other," Stewart said. "And then they get spooked and they start spreading."